I left sinking the seatpost for last for better or worse. Start with some kind of seatpost or seat tube shim. Sinking a few inches of a real seat post (not the seat tube that attaches to) will increase the strength of your bamboo seat post (a shim will not provide much support). I went with a steel seat tube 28 x 9/6 x 650 mm from Nova Cycles. This fits the extra seat post I had laying around. When you are cutting your poles make sure that you have enough room between the top of your bamboo seat tube and the nearest node to sink your metal seat tube. The requirement here is that you need to meet the minimum height requirement for your seat post (as shown above). Keep in mind that you don’t need to be able to fit the whole seat post in. You can cut it to length if need be (just make sure you use the same minimum height rule so the seatpost doesn’t snap off on you). NOTE: I would not recommend sinking the actual seat post directly into the bamboo and then clamping it. 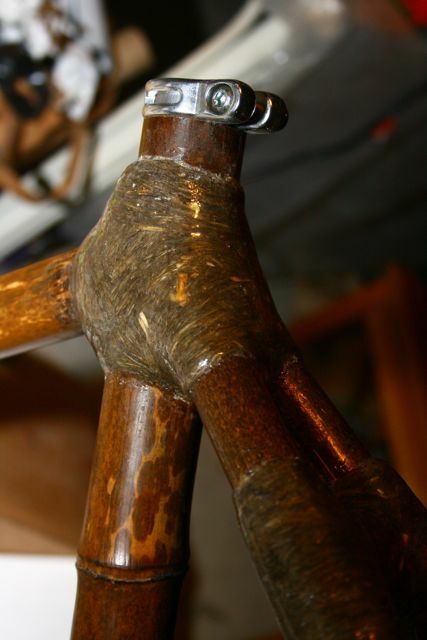 This would likely crack you bamboo… I’ve seen a picture of a cracked bamboo seat tube online. Not a good idea. The real pain here is reaming out the inside of your bamboo pole to allow your metal seat tube to fit inside. I used a curved course wood rasp (above) and a lot of sweat (not shown). Tape some cardboard around the pointy handle of your wood rasp to keep your skin on your fingers. I would recommend going slowly and making sure you don’t screw anything up here. It is easy to over-ream any particular area or side. My first goal was to fit the seat post (smaller diameter than my metal seat tube) first. After this I put a piece of 80 grit sandpaper around the seat post and rotated it until the bamboo would accept the metal seat tube (also shown above). This worked very well and I highly recommend it. Next you have to cut your metal seat tube… use your dremel with reinforced cutting disks, or use a good old saw. But clearly the dremel is more fun. A lot of metal flies around so be careful. Make sure to cut it a little longer than needed because you will have to leave room for the seat tube clamp (binder) to clasp onto (shown above). Make sure it all fits. Then you need to cut a small slit vertically down the metal seat tube so that the clamp can compress the metal around your seatpost. Widen it a bit and try clamping your seatpost down. Also sand down the rough edges. Now slowly cut away the bottom of your metal seat tube (non slit side) until your seatpost clamp fits just right. Now glue away. I would recommend using some 404 west systems high density filler to fix it in place. I made mine a watery mayonaise consistency. This allowed me to pour some into the bamboo tube creating a 1/4″ pool of epoxy at the top of the bamboo node (ie as deep as I could get my metal seatpost in). In addition to the pool of epoxy at the bottom, I found that building up a thick layer of epoxy on the inside of the bamboo seat tube and a light layer on the outside of the metal seat tube worked best. Make sure that you follow the instructions for proper bonding with metals (found under the “metal bits” page). 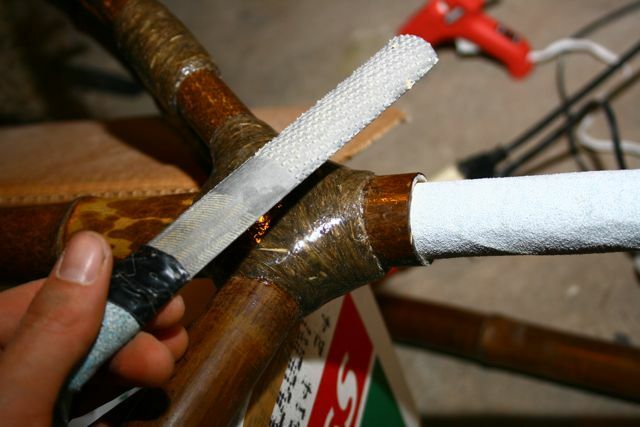 Also as with all of your sanded bamboo bits (the inside of your bamboo seat tube this time) make sure that you ‘wet it out’ first (ie use a brush and cover all sanded bamboo with some epoxy before you start). I am confused as to whether you put the sand paper around the metal seat post or the metal seat tube in order to widen the bamboo tube to insert your metal seat tube. It might be that I’m just confused about when you use the seat post and when you use the metal seat tube in this description. Thanks. Thanks for the comment here. I corrected my instructions to clarify. You can wrap 80 grit paper around the seat post in order to make room for the submerged seat tube (which the seat post gets clamped into). 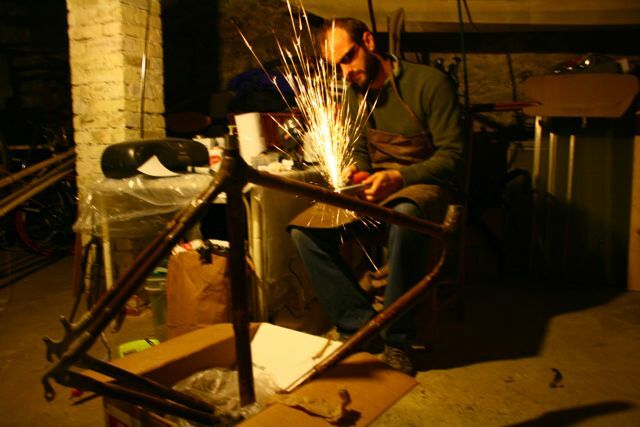 Interesting project.The Ghana Bamboo Bike Project a student led project of the Clinton Global Initiative University is looking at the prospects of our bamboo bike project in Ghana producing high quality bamboo bike frames for you in the US and you training prisoners in state prisons to assemble them for the US markets what do you think? Sounds amazing. Im sure both projects will be a success. 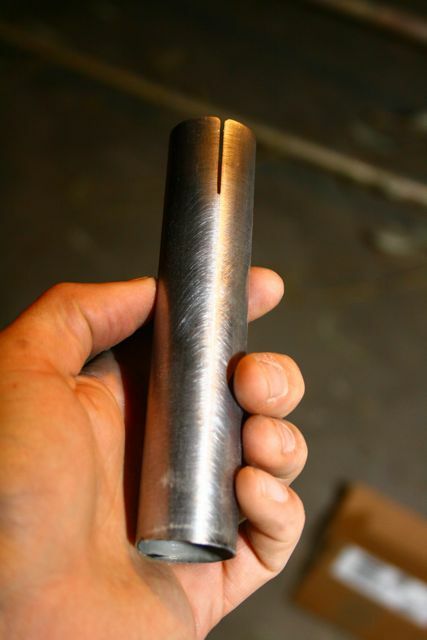 Just wanted to add a tip here….when you cut the slit on your seat tube insert if you leave it the way you have it here the metal may be prone to cracking down the length of the tube. 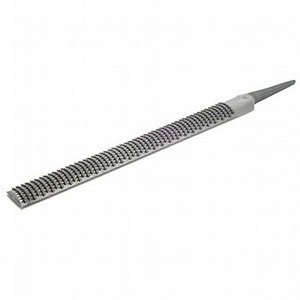 If you drill a small hole at the bottom of your slit this will prevent it from cracking. Something I did if you want to shave a bit of weight. Make a fiberglass sleeve insert instead of using a metal one. 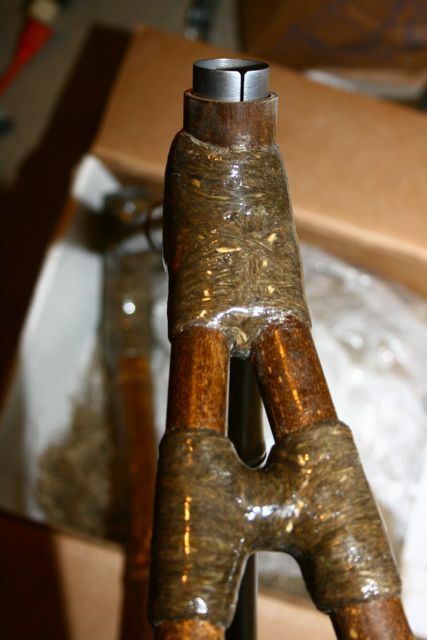 Take whatever sized seat post you want, coat the post with paraffin wax to build at up approx. .02mm of clearance, coat it in release, and then form a fiberglass seat post sleeve around it. The trick is to make sure you have a snug fit between the sleeve and the bamboo; I recommend using an appropriately sized boring bit, bore out the bamboo to fit the sleeve. You may have to sand down the sleeve or build it up to match the boring bit you’re using. Thanks for the corrections on the seat tube insert.anyway,i’m also a bamboo bike builder in Accra Ghana.west/Africa. I was trained by Craig Calfee in the year 2007.i was first African boy Craig trained in Africa. What i also know about the seat tube insert is that,after inserting the seat tube insert into the bamboo,you need to leave a space to wrap fiber under it. Great. Thanks for the input! do you have a type of bamboo grown in the us that you prefer to use, i have been using the blue hennon bamboo which is strong but heavy. any suggestions? The truth of the matter is that bamboo is going to be a bit heavier no matter what. Blue hennon should be pretty good, I think its a bit lighter than black bamboo. However you could try iron bamboo… let us know how it goes! You should get in touch with the people at Bambooseru! I’ve got the opposite to what you had here. My bamboo pole is too wide and the seatpost doesn’t fit snuggly. I’ve thought about putting a filler down the pole but i’ve punched the nodes out so it will run. Has anyone got any suggestions? It’s about 2cm or .8 inches out. You might just buy a seat post shim. You can buy them at most online bike stores. Just make sure you get the right size for your seat post! Been using this blog and it’s pretty useful . Good info and good job! Just wanted to as one thing regarding metal tubing; after cutting the slit in the tubing you should drill a small circular hole at the bottom if the cut . That ways it helps prevent the cut from traveling any further and any cracking .